Organic Red Lentils (ORL) are orange, not red. This is a photo of dried organic red lentils (ORL) in a strainer, ready to be picked over and rinsed. This is an important step in making any kind of lentil recipe. ORL are a bit sweeter and nuttier than other lentils. ORL readily absorb a variety of flavors from other foods and seasonings. Adding veggies, spices, and herbs make lentils abound with flavor. ORL are a good source of gluten free plant-based fiber. ORL can be sprouted easily and added to salads. 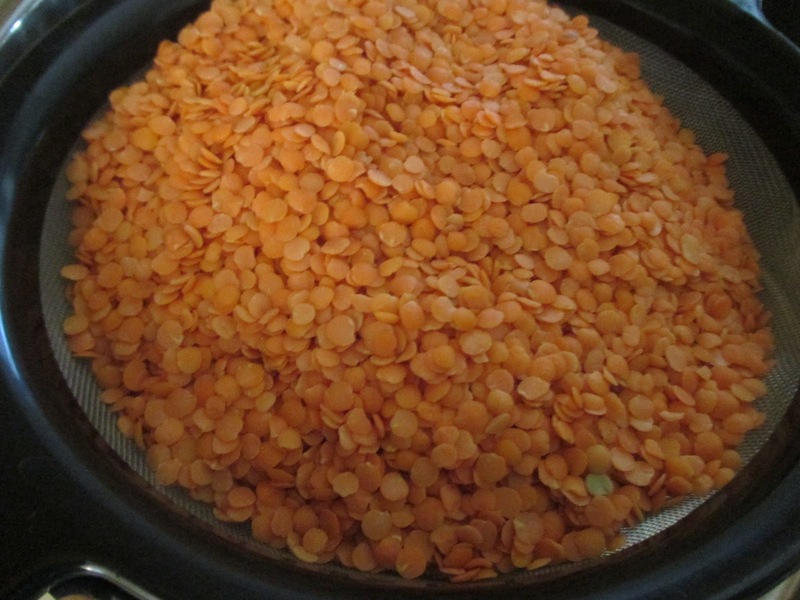 The link below is for sprouting green lentils, but the method can be used with whole red lentils as well. With red lentils, rinse at least twice a day. Red lentils take only a day or 2 to sprout (depending on how fresh they are). Here's Cassie to show you how. How to Sprout Lentils/. When cooked in a recipe, ORL are ready to eat in about 20-30 minutes. The cooking time varies, depending on whether you use whole or spit ones. Cooking times are influenced by the cooking method (boiled, baked, slow cooker, or pressure cooker), amount being prepared, and kinds of ingredients in the dish you are preparing (ex. tomatoes and tomato sauce increases the amount of time needed to thoroughly cook lentils). When you want a shortcut, use canned lentils, but remember this type of lentil is fully cooked. ORL are relatively inexpensive (prices usually range from $2.99-3.99 per pound). Cooking (boiling) lentils expands their volume. Lentils supply many important nutrients and using them in recipes is a frugal way to eat smart. ORL can be a comfort food. It is for me. Their slightly sweet taste and ability to fill you up, without fat, is certainly a healthy way to satisfy even the heartiest of appetites. ORL are versatile. You can cook them, as part of a pilaf using fragrant Basmati rice or enjoy lentils as a flavorful pureed side dish called Dahl, as they do in India. Lentils have an earthy flavor that enhances soups, stews, chili dishes, and lentil loaf or patties. ORL can be an important part of meal planning throughout the year. I couldn't find a Red Lentil Soup recipe that worked for me online, so here’s my original recipe that I adore. I make it at least once a month for my family and friends. I freeze any leftover soup in individual containers and heat and serve, when I'm rushed for time or don't have the ingredients on hand to start from scratch. Optional Ingredients: any cooked vegetables or cooked beans you enjoy. For instance, you can add zucchini, spinach, kale, butternut squash, string beans, pinto beans, or parsnip. When I made this recipe the last time, I included the contents of a can of organic pumpkin. 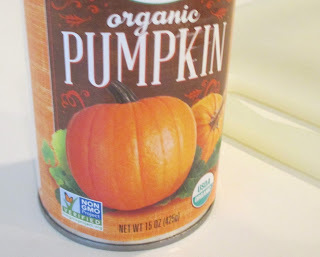 Then, I needed to add an extra cup of water, because the pumpkin made the soup too thick to stir. When adding extra veggies, remember to add extra spices and a little water. Dried herbs go into the pot right away. Fresh herbs go in at the end of the cooking process. 1. Pick over and rinse dried lentils. Pour water and/or water and broth into a dutch oven or other large pot that has a cover. Add lentils into the pot and place on the stove. Set control to boiling temp. 2. While contents heats, clean and chop all veggies, garlic, onion, and fresh herbs. If you have a food processor, chop all veggies well. If you don't have a processor, do the chopping by hand. 3. Add onion, carrots, celery, turnip, bay leaf, Bragg Liquid Aminos, chopped garlic, and a pinch of salt-free seasoning blend to pot. Let ingredients come to a boil. Reduce heat to simmer and cover. Cook for at least 20 minutes, stirring every few minutes. This kind of soup has a tendency to stick to the bottom of the pot so take care (Notice: I used no oil). Cook until lentils and veggies are tender, and begin to get mushy. 4. Add chopped parsley, basil, and any cooked veggies you have decided to add. Also add the oats or rice, and heat thoroughly for approximately 10 minutes. Ta Dah! You're good to go. Season with more salt-free seasoning and pepper at the table. Soup stores well, in the fridge (for about 4 days) or freezer (for a few months). It's an easy, delicious, and nutritious way to eat more veggies and legumes. Make it often and enjoy! While you're at it, check out additional recipes below that feature red lentils. They sound fabulous to me. During the next few months, I'm going to try each and every one. How simple and flavorful can lentil dishes be? Let me know which red lentil recipes appeal to you. Would you like to share one of your favorite red lentil recipes with us here? I sure would like to learn new ideas from you. Thanks for visiting today. If you can, post a link to this blog on social media and like and pin it. Why not become a follower? If you do, you'll be notified the moment I post again. I'd love to get your feedback. Send comments and questions to me by clicking on the white envelope. My email is obloggernewbie@gmail.com. Let's get social. I've never tried lentils, but now that I know how good they are for you I'll have to give them a try! I'll be saving this recipe to try later! Thanks Brandyn for your comments. Sure know you get a powerhouse of nutrition, when you do use lentils. It was fun to hop on board #MommyMeetupMondays. I wanted you to know I re-posted your share on Google+, to help spread the word about this hop. Thanks Danielle for the visit. I definitely will look at those recipes and check out Waste Not Want Not Wednesday, Be well and enjoy this fine day. I love lentils too! With yummy ingredients like these, I will be making this soup for friends and family quite often. Thank you so much for sharing this healthy and delicious Nancy A's Hearty Red Lentil Soup Recipe at the Healthy Happy Green and Natural Party Blog Hop! I'm pinning and sharing. This recipe sound so healthy and tasty. Sounds like a perfect meal for a nutritious boost to your day. Thanks for sharing the health benefits. Pinned. Have a healthy happy blessed week. Thanks Marla. I appreciate the support. Wishing you the same and sending you a hug. Nancy A.
Hearty Red Lentil Soup Recipe recipe at the Plant-Based Potluck Party Link Up. I appreciate it and I’m pinning and sharing. Thanks Deborah. I agree. Lentils are super comforting and flavorful. I'm so happy you'll be using my recipe. Likewise about the pins and shares. 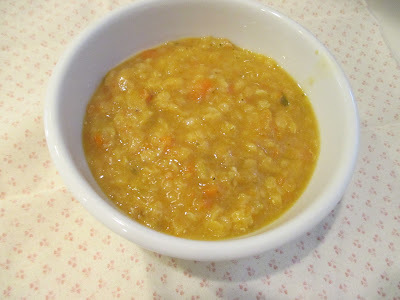 Nancy A.
I am delighted that you shared your healthy and delicious Hearty Red Lentil Soup recipe with us on the Plant-Based Potluck Party Link Up. I appreciate it and I can't wait to try your recipe. I'm pinning and sharing. Thanks so much for commenting. I want to make this soup too, but have not been able to get fresh organic celery in the market. There seems to be a something going on with the celery crop. Hope I can find some this weekend. Speaking about weekends, wishing you a wonderful weekend. Thanks so much for reading my recipe at the blog hop. Your recipe sure looks like one I'd like to try. And mung beans are so delicious sprouted. I put them in salads to increase the crunch factor. Warm regards, Nancy A.
Hi Nancy. I always adore lentil soup, especially when chocked full of vegetables. The addition of turnip here is interesting and appealing. Thanks for sharing with MLLA. Thank Lisa for hosting at MLLA. I so enjoyed taking part. 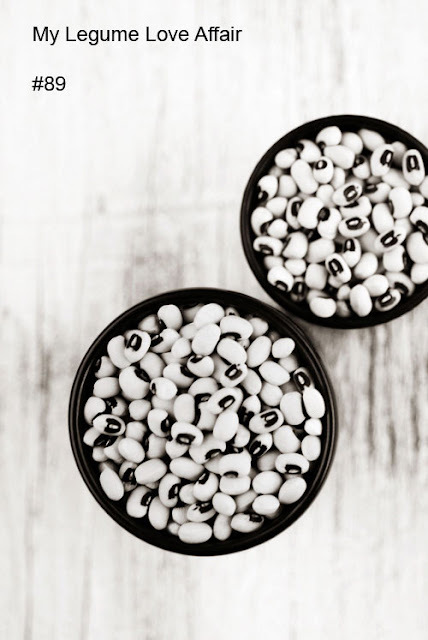 Your recipe for Spicy Black eyed Pea Sambar sounds yummy. I like it so much I pinned it! Such a lovely and thoroughly explained post, you have covered all aspect of this lentil. This soup is really healthy, I agree with you it is a comfort food. Thanks for sharing with MLLA, I am reminding you to link with Lisa and Susan's page as mentioned in rule number 6 of MLLA novermber. Please come and see the roundup of MLLA, your recipe is feathered there. I am thrilled and honored you would pick my blog post to be featured at the roundup of MLLA. What a joy it was to participate. Thanks again. Nancy A .
Lentil soup is my go to soup in cold weather. I love the inclusion of pumpkin and rice or oats. What tasty ideas. I am delighted that you shared your healthy and delectable lentil soup recipe with us on the Plant-based Potluck Party. I appreciate it. I'm so glad you are partying with us. I'm pinning and sharing. Thanks so much Deborah. I too am a lentil soup lover, especially in colder weather. The Plant-based Potluck Party is so much fun. Hope my readers will check it out and continue to revisit as there are many interesting things to see. I learn so much from the other bloggers' posts and appreciate you. You're such a gracious host! Nancy A. Thanks so much Judee. And I pinned your recipe. It looks and sounds so yummy. I like to vary things,so you better believe I'll use your recipe from time to time.Be well and enjoy the weekend.